But the Star Wars galaxy is too vibrant, too dynamic, and too full of adventure to simply fade away. Even after the Jedi had returned, the Empire had been toppled, and the original trilogy had been completed, the galaxy begged for further exploration. This was where Star Wars: The Roleplaying Game came in. With its award-winning ruleset, its focus on operatic space adventures, and the many starships, vehicles, droids, creatures, and aliens detailed in its sourcebook, West End Games didn't just allow Star Wars fans to continue pursuing the ways of the Force, it left an enduring impression upon the galaxy itself. 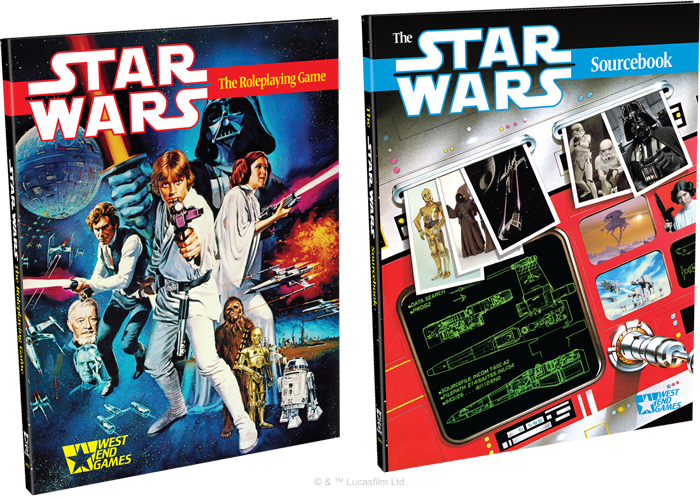 Now, forty years after the debut of A New Hope and thirty years after its first printing, Star Wars: The Roleplaying Game makes its return as a limited edition set of two lovingly recreated, hardcover books, Star Wars: The Roleplaying Game and The Star Wars™ Sourcebook! The Star Wars: The Roleplaying Game 30th Anniversary Edition faithfully recreates Star Wars: The Roleplaying Game and The Star Wars Sourcebook as high-quality, hardbound tomes that feature all the original game rules, information, and graphic design. These are printed on higher quality paper than the original versions and shrinkwrapped together in a stylized slipcase that features the original cover art on a clean black background. Every bit as playable now as it was in 1987, Star Wars: The Roleplaying Game offers fast d6-based action along with unique takes on the ideas of roleplaying, designing adventures, running adventures, and the nature of the Force. The rulebook also introduces a full-length adventure, "Rebel Breakout," and The Star Wars Sourcebook provides you with a wealth of information that you could use to populate additional adventures, including detailed descriptions of starfighters, capital ships, droids, aliens, blasters, lightsabers, and combat vehicles like the AT-AT and AT-ST. Notably, these books and their contents did more than inspire countless gamers at their tables; they helped shape the Star Wars galaxy itself. Elements from The Star Wars Sourcebook have since become Star Wars canon, such as the names of the alien races, Twi'lek, Rodian, and Quarren. Timothy Zahn was given the books as reference when he was developing Grand Admiral Thrawn and his Thrawn trilogy. And the rulebook's chapter on "Designing Adventures" so clearly and effectively deconstructed the particular nature of space opera to which Star Wars belongs that Pablo Hidalgo cites it as inspiration for the writers' bible he developed for the Lucasfilm Story Group. This critical tie between Star Wars: The Roleplaying Game and our current apprecation of everything Star Wars is brought to life in the foreword Pablo Hidalgo wrote for the 30th Anniversary Edition, and it's one of the few changes between this edition and the original. You'll also find a few updated photos, pieces of concept art, and advertisements, but they're all carefully designed to match the book's original style, including its alternating use of black-and-white and full color. "Kid, I’ve flown from one side of this galaxy to the other. I’ve seen a lot of strange stuff." Forty years after A New Hope, the Force and the Star Wars galaxy are more powerful and resonant than ever before. They permeate all walks of life by way of movies, television shows, comic books, novels, games, and licensed merchandise. They bind us together. 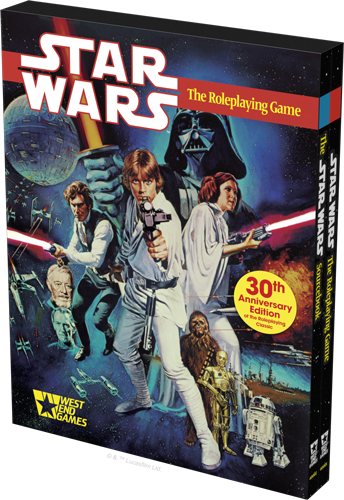 West End Games' Star Wars: The Roleplaying Game is a significant part of the wider Star Wars legacy, and Fantasy Flight Games is proud to present this limited, commemorative 30th Anniversary Edition! Star Wars: The Roleplaying Game 30th Anniversary Edition (SWW01) is scheduled for release in the fourth quarter of 2017. Pre-order your copy from your lcoal retailer today or from FFG here. Then find more information on the game's description page! The rules and reference materials presented in the Star Wars™: The Roleplaying Game 30th Anniversary Edition are not compatible with Star Wars™: Age of Rebellion™, Star Wars™: Edge of the Empire™, and Star Wars™: Force and Destiny™.